So I just bumped into this on the internet. It’s a must see, must do if you are gummy bear fanatic, like almost everyone I know. Just when you thought gummy bears couldn’t get any cooler…they hit the age of 21….and became Drunken Gummy Bears. Yup, Re-up your gummy stash this weekend and throw them in a pool of liquor to get this awesome little treat that we stole from a pretty little tumblr site called Life is Butter Dream. Put your gummy bears (or other gummy candy) in a bowl of your choice. 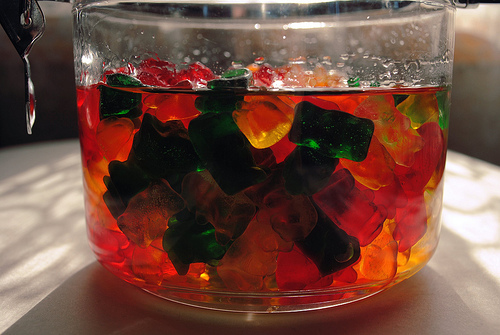 Pour the liquor you are using into the bowl and cover about a 3/4 inch over the top of the gummy bears. You can put a lid on them or leave them uncovered if you would like. These MUST be left in the fridge, if not they will fall apart and turn into a huge glob of goo. The minimum to soak these is about 5 days, but the longer the better for them! Make sure to stir them 1-2 times daily to get them evened out. You can use ANY kind of alcohol to make these. Use flavored alcohol to make them even yummier! 7-10 equal a shot of the liquor you are using. They will stay good in the fridge for a very long time! Serve them with a toothpick for cleaner eating. You best believe I’m trying this at home tonight. This entry was posted on Thursday, December 22nd, 2011 at 8:01 pm	and posted in Check It!, Recipes. You can follow any responses to this entry through the RSS 2.0 feed.